We’ve been talking about the three-wheeled Elio for quite some time now, from the bad, to the questionable to the good. Well, we don’t really have much in the ‘good’ category, but let’s just say I really like the idea of a cheap-three-wheeled car. One thing that’s been consistent has been the planned price: $6800. Now there’s an official price that’s a bit more, but it comes with a huge catch. A mass email sent today from founder Paul Elio covers a lot of developments in the company: they publicly listed their stock, they figured out how they want to handle their option ordering system, and they talked about their latest prototype. All that’s great. “Where a start-up company that has not generated revenue seeks to commence or progress operations, … in all but the most extraordinary circumstances, market studies and non-binding customer reservations to purchase vehicles will not be sufficient…” [Emphasis added]. That start-up that “has not generated revenue to commence or progess operations” is Elio, and currently, even though 85 percent of their 56,000 reservations are “non-refundable,” they don’t actually require the potential purchaser to buy the car. Well, if they want the loan, they have to do just that. Readers with exceptional math skills may have noticed that’s $300 higher than the headline, and that’s because Elio is offering a price of $7000 as an incentive for “non-refundable” reservation holders to move up to a binding commitment. Based on our current engineering models and materials calculations at this juncture, we will lock in the base price for “non-refundable” reservation holders at $7,300* until we reach 65,000 total reservations (all reservations, both non-refundable and refundable). Given the current expectations, this price supports our vision and provides the most affordable vehicle option on the market. It’s not clear if the price is expected to rise after the 65,000 reservations or not. So, while the price is a bit above the goal of $6800, it’s still an incredibly reasonable price for a new vehicle, even one with 25 percent less wheels than an average car. But the real news here is the need for binding agreements. Currently, Elio reservations have been refundable and non-refundable only. Refundable carried minimal risk, and non-refundable had some risk, but only limited to the amount of the deposit, between $400-$900. Paragraphs 2 and 6 of the standard terms and conditions are hereby modified to provide that I am agreeing to purchase a base model vehicle for $7,000 excluding destination/delivery charges, taxes, title, registration, options/installation and any other fees. While maintaining my present place in line for delivery, I understand that currently there is no definite date set for production or delivery of my vehicle. Seven grand for a three-wheeler with a warmed-over Metro engine that you may or may not actually get is a pretty big thing to ask the car-buying public. It’s especially tricky because Elio clearly needs to that ATVM loan to actually build the cars, but they can’t get the loan unless enough people believe they will actually get the loan and order the cars. This feels like one of those catches of the twenty-second variety, a bit. 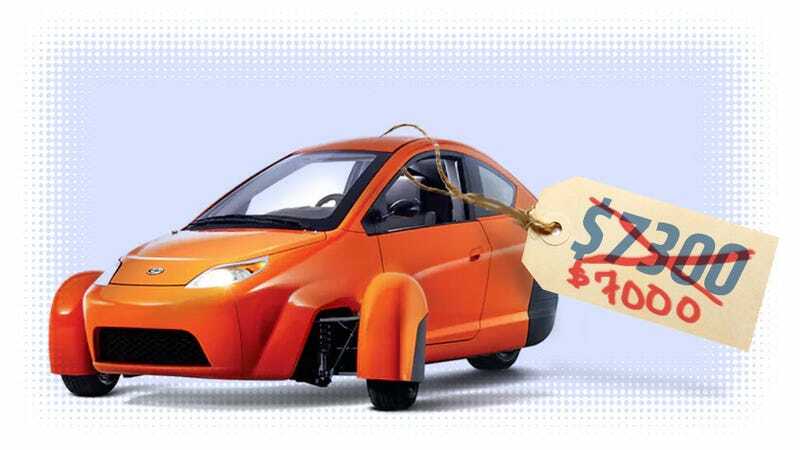 As I have previously shared, the ATVM program is not a breaking point for Elio Motors. However, based on our projected impact on the market and the economy, it is a program that we believe was custom designed for a company like ours. Therefore, our hope is that the implementation of the above steps will satisfy the recently revised ATVM requirements, resulting in Elio Motors being awarded an ATVM loan. Honestly, I’d like to see Elio succeed, because I genuinely love the idea of a vibrant category of sub-$10,000 three-wheelers flourishing in the U.S. But even if they manage to make a car where the fenders can stay on, I’m still not so sure how much confidence I have that this is all going to pan out.